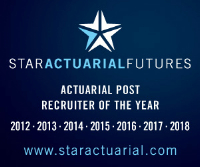 Leading insurer requires dynamic, bright graduate to join their expert team of actuaries. The role would include work across all areas including reserving, pricing and capital modelling: an ideal introduction to the market and a stepping stone to a blossoming actuarial career. The ideal candidate would have a degree 2.1 or above in a numerate subject, strong IT skills, a keen interest in the market and a real desire to learn and succeed. This is a fantastic opportunity to gain across the board experience and work closely with highly qualified actuaries.